“A truly great New York photographer”, Cyma Rubin, Emmy Award Winning producer/director of Moment of Impact: Stories of the Pulitzer Prize Photographs. “If he were a painter, he would have been Degas”, Richard Wald, Professor of Journalism, Columbia University. “His picture caught the whole essence of what Babe Ruth was... and it allows the reader to take his own imagination and experience into the story”, Hal Buell, former head of AP Photo and author of Moments: Pulitzer Prize Winning Photographs. Nat Fein worked as a staff photographer for three decades at the legendary newspaper, The New York Herald-Tribune. His is a classic depression era success story of a man who rose from the depths of poverty to the pinnacle of success in the world of photojournalism, culminating in his 1949 Pulitzer Prize winning photograph of Babe Ruth. To this day, it remains the only sports themed photograph to win the Pulitzer. Through the use of file footage, interviews with family, friends, contemporaries, and experts, plus the use of Nat’s own, incredible photography, the documentary tells the story of a man whose work captured the essence of both a city and an era. Included are actual interviews conducted with Nat in the early and mid-1990’s. It is a great privilege to be able to hear this master craftsman talk about his incredible experiences on the streets of New York. And Nat was known as a master storyteller – in his pictures and his words. In addition, there is exclusive footage, also shot in the 90’s, of Nat at Yankee Stadium as he recreated his steps leading up to the famous photograph of Ruth. He had not been back there in the nearly 50 years since he made the shot. It was an emotional day. Nat Fein: A Talent for Living tells how, when Nat first began at “The Trib” as a copy boy, he would break into the paper’s dark room after hours to learn more about photography; photographers earned a few more dollars a week than copy boys! After being caught by a sympathetic editor, he was given a key. Now, all he needed was a camera. In a move that would change his life and color his work, his mother gave him $90 to purchase a Graflex Speed Graphic camera. And the rest, as they say, is history! With that camera, Nat took some of New York’s and the worlds’ greatest images, chronicling daily life in the city: from the great to the small. Nat’s photos always speak to our emotions. They are never “flat” depictions. They were creations. In fact, Nat never said he “took” a picture. Rather, he would say he “made” a picture. That’s because each photo is a piece of Nat. Our experts tell how Nat was one of the first of a group of photographers to change the face of photojournalism by breathing life into their subjects. 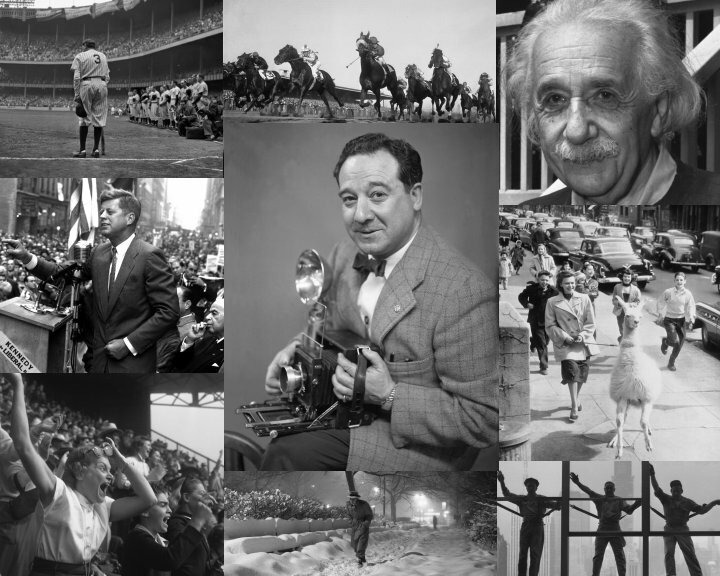 Nat Fein: A Talent for Living shows how the intense competition between papers and photographers in the 40’s drove each man to make his picture the best. Nat and a handful of others hit the streets everyday in search of the “perfect” picture. This intensity gave birth to a creative bonanza that many experts call the golden age of photojournalism. Not only was Nat highly respected in his field, he was well loved by his family and friends. Interviews show a man that gave so much of himself - in his work, and in his life. When he was not making award -winning photographs, he was singing cabaret songs at a local restaurant. Or, he was sketching a cartoon to give to a friend. Nat Fein was all about giving. It was the key to his work. In a career that spanned over five decades, Nat left a incredible body of work consisting of thousands of photographs depicting the lives and events that make New York the center of the world. His photos capture an era that once was and can never be again. Therefore, they have taken on a sense of history. In addition to that historic significance, his work also contains a sense of emotion and a feel for humanity that make them uniquely Nat Fein’s.